I was having one of those evenings where the babies were see-sawing between mildly entertained and fussy, but I also really wanted to cook something yummy. I had ground beef and carrots in the fridge, onions and seasonings in the pantry. I didn’t feel like pasta, especially because my homemade Alfredo sauce the night before was an epic fail. But suddenly, I looked in one of my cabinets and spotted this handsome devil to the right. Now, before you get all judgy, I’ll have you know that instant mashed potatoes are freakin delicious. They give you that whipped texture without all the added work. For a mom of twins who doesn’t have very much free time for cooking – that’s everything. Brown the ground beef in a pan. Drain the excess fat, then return it to the pan. Add in your chopped onions, diced carrots, peas, red pepper flakes, pinch of celery salt, regular salt (to taste) and minced garlic to the cooked ground beef and stir together. Cover and let it all heat together at medium heat for about 5 minutes, stirring occasionally. Meanwhile…gotta get yo gravy goin’! 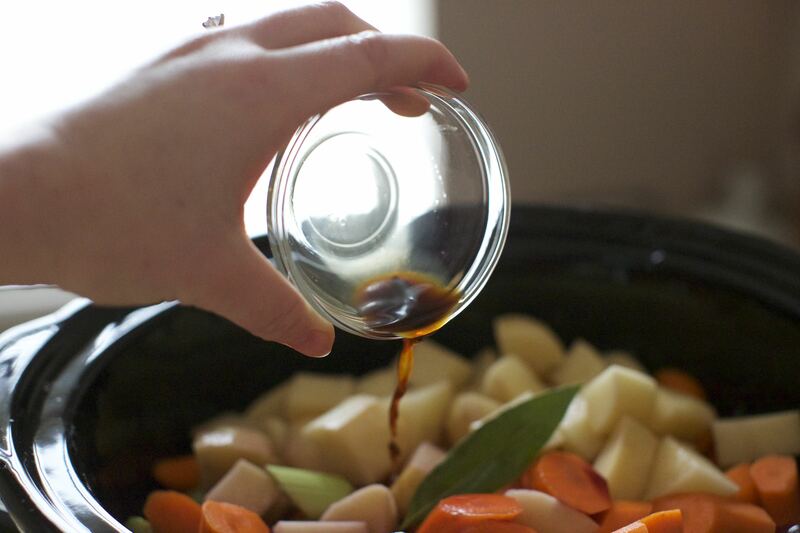 In a separate pan, whisk together the beef broth, flour,Worcestershire sauce and butter over medium high heat. Bring just to a boil while stirring continuously, then remove it from the heat and add the gravy to your ground beef mixture. Let this sit without heat while you jump into step 4. Also – now’s a good time to turn on your oven’s broiler to low heat. Bring 4 cups of water to a boil, then remove it from the heat. Add the 8 oz package (or the two 4 oz packages) of powdered mashed potatoes and quickly stir it all together until it’s smooth. Within seconds you have gorgeous delicious garlicky mashed potatoes. Sooooooo easyyyy! In a casserole dish, layer the ground beef mixture first, then top it off with the mashed potatoes. Be sure to cover the ground beef completely with the mashed potatoes so that the ground beef mixture won’t bubble over and ruin the pristine potatoey topping. Pop that dish in the oven and broil it on low until it’s juuuust golden brown on the top. Let it cool a bit before serving, garnish with a little parsley on top, then serve it up! This dish is a total hit since the first night I made it. Some nights I made it without carrots, sometimes without peas. It’s super adjustable depending on what you have in stock. Hope y’all enjoy a slice, or 3, on an upcoming cold winter night! Be sure to comment/share if you give it a try. I’d love to see pics of your “pie”! The weather here in Oklahoma is finally getting chilly! I’m so excited to be slow-cookin my way into cooler weather these days. As my patience for reading through recipes gets slimmer (’cause……twins!) I find myself throwing ingredients together in a mad dash between entertaining and feeding two babies. Sometimes my ‘lil on-the-spot meal creations fail. But every once in awhile……they WIN! I’ve got a winner for ya. I’ve noticed that most people don’t put a base of some sort underneath their chili when it’s served. Well, my sweet southern belle of a mama raised me differently. Mom would typically cook up some white rice and use that as a base for the chili and it was deeee-lish! But recently I got the inspiration to use cheesy grits as a heavenly little platform instead. I made this on Sunday afternoon, stored it in the fridge (where it only continued to grow more and more delicious), then by Monday afternoon I was ready for a hearty lunch. I came home from taking the twins with me to Target and they were still asleep in their car seats. WIN! I whipped up some grits, added freshly grated cheese, topped the dish with chili, then more cheese for the garnish, and then…The Hallelujah Chorus broke into song. It was delicious, hearty, and good for my tired mama soul. Do you have a tired soul these days? I highly recommend trying this recipe. Your soul and stomach will thank you. Combine all of the dry seasonings (chili powder, cumin, garlic powder, italian seasoning mix, salt, and cayenne pepper) into a small dish, then set aside until Step 3. Cook the ground beef in a skillet so that it’s just browned. 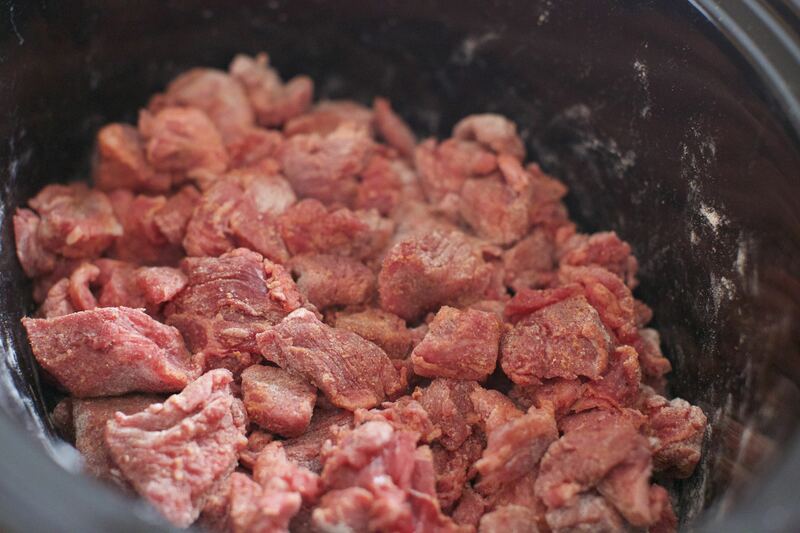 Drain the excess fat, then return the ground beef to the stove. Add dry seasonings to skillet, coating the browned ground beef. Be sure to turn the heat to low. 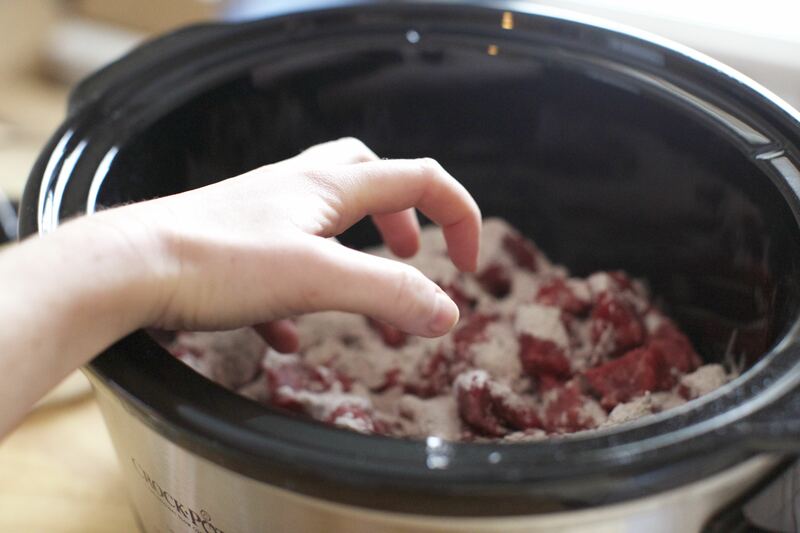 Pour the seasoned ground beef into the slow cooker. Add the following: raw coarsely chopped yellow onions (I don’t recommend cooking the onions with the ground beef in step 2 because it gives a slight crunch to the chili – loved it! ), drained pinto and kidney beans, diced tomatoes, beer, and marinara sauce. Stir well to combine all that gloriousness. Set it and forget it, y’all! Set it on high, and stir occasionally if you have time. 2 to 3 hours later your home will smell heavenly. Once the chili is ready you can get the instant grits going in a saucepan. First, boiling your 1 cup of water, then add the grits, salt (to your taste), and butter. Be sure to stir this well to avoid clumps. 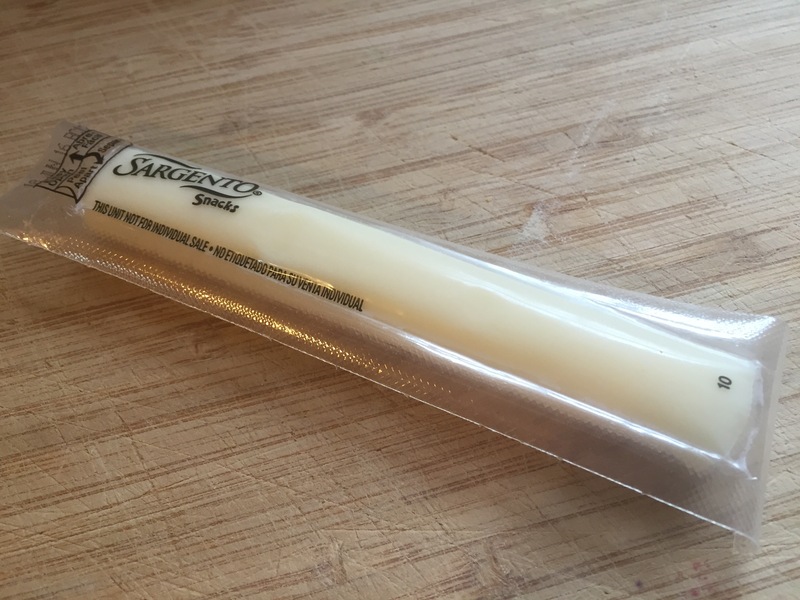 Then…the cheese! Stir the shredded cheese into your grits. Add enough cheese until it tastes just right for you. Layer the cheesy grits first, then the chili, then some more shredded cheese for garnish. Food! It’s easily the hot topic on my mind every day. Hunger is no joke when you’re pregnant, especially with twins. A few weeks ago my OB & high risk doctors had me take the glucose test (many pregnant women have to take it) in order to rule out Gestational Diabetes. It involves drinking a drink that tastes like a SUPER sugary orange soda within 5 minutes, then waiting 1 hour at the Dr’s office or local medical lab, then getting your blood drawn. Well…I failed the first test. Womp womp. I’ve heard that many other women do and sometimes it’s related to what you ate before hand even though we don’t have to fast for this test. To make sure that I didn’t truly have Gestational Diabetes, I was asked to take the 2nd test, a.k.a. the 3 hour glucose test, one week later. For this 3 hour test you have to fast for 8-10 hours starting the night before. At the appointment you get round #1 of 4 done for your blood draws, drink the sugary drink, then get rounds 2, 3, and 4 of more blood draws at 1 hour intervals. That was a long time for a VERY hungry pregnant woman to not eat anything since the night before. Good news…I passed the 3 hour glucose test and do not have G.D.! Woohoo! Bad news…I nearly passed out at Sprouts getting food right after the test. It was really bad, y’all. Apparently the Dr’s office even tried to call me after they received the results because my last blood result was the lowest they’d ever seen. I was a mess: blurred vision, shaking, dizzy, starving, out of breath, and even in a cold sweat. It took me a good 5-7 hours to finally feel normal again. Low blood sugar is something that I assumed I had just a little of, but I had no idea it was that bad. Long story short – I need to eat little meals ALL the time to help maintain the crazy hunger I’ve had these past 9 months. Even though I don’t have Gestational Diabetes, the process of those tests was a strong reminder that I’m eating for 3, not just me. Obviously I was well aware of this to begin with, but when cravings strike and you’re hungrier than you’ve ever imagined it can be a struggle to have the patience of nutrients in mind at the pace that my scrunched organs can handle each digestion. I’m reminded that this is the time for some serious diligence. For the next decade or so these little ones will be completely dependent on me & Sean for what nutrients they get and what food choices they will ultimately make as they grow up to take on the world by themselves. Oh my gosh…I can see it now – they’re already growing up so fast!!! Though I haven’t drastically changed my diet or anything, I have really learned to maintain more of a daily pattern that both I and the babies can depend on; to not get to the “insane hunger” level as often by balancing each day with consistency. I thought I’d give y’all a “taste” (hehe) of what I ate yesterday for a sample of what’s been helping me. The twins are pressing on my stomach and lungs as they continue to grow, and too much food at one time just doesn’t work (3rd trimester heartburn problems). With that in mind, you’ll notice that I eat every hour and a half to two hours. Note: at least twice a week this is replaced with a chocolate milkshake from Freddy’s or Braums. Just sayin…it’s good to add some extra calories in there from time to time :). 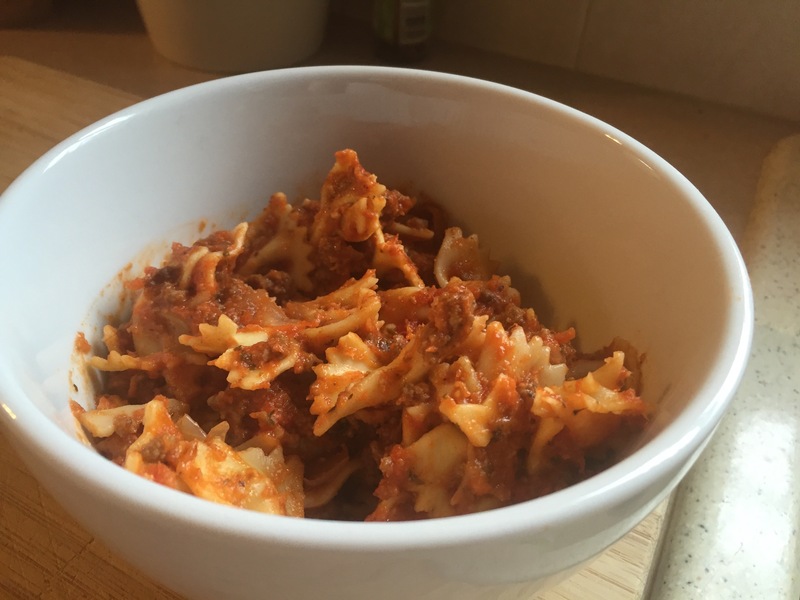 ¾ of a bowl – it’s like his version of lasagna but with bowtie pasta. Super delish! It’s been nearly 30 weeks and the 30 pounds that I’ve gained with this twin pregnancy is exactly right on track with where I should be. I’m so proud of that! More than anything, I love that it makes me feel good when I interrupt menu’s like the one above with a juicy burger, savory pizza, velvety chocolate cake, or whatever else ;). It’s well deserved when 80-90% of the week is balanced with everything these babies need! I love how my preggo-cravings are like my body’s way of telling me which nutrients that my growing twins need. Our bodies are SO amazing at telling us what we need/don’t need if we listen well enough! My latest cravings have been for chickpeas/garbanzo beans. I love them, I need them, and I craaaave them. I’ve learned that chickpeas pack a hearty dose of nutrients that any baby-mama needs. Things like: magnesium, calcium, zinc, iron, fiber. They even help to lower glucose levels! 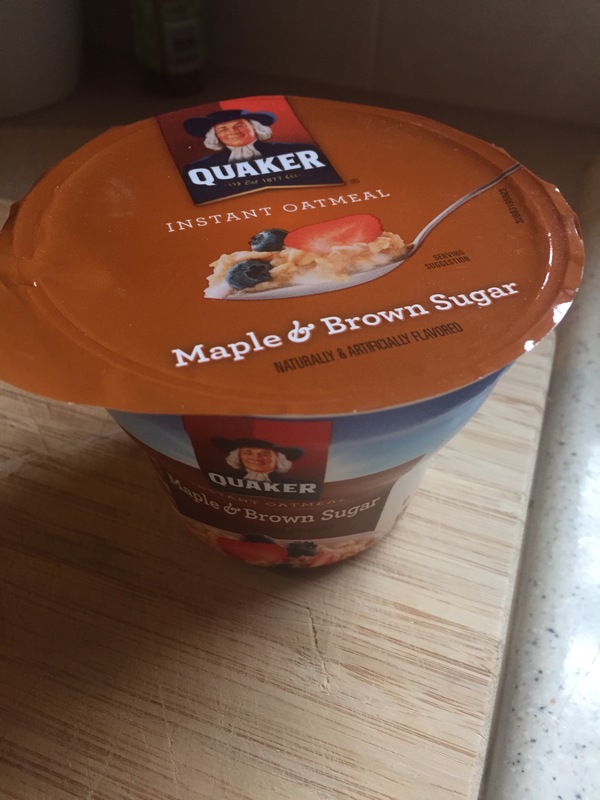 Since my twin pregnancy automatically puts me at a higher risk for gestational diabetes (I’ll find out later this week if I passed that test…eeek! ), it’s no wonder why I’m craving them lately. I’d like to think that I’m usually a pretty healthy lady 80-90% of the time by avoiding unhealthy foods, but I’m “normal” and love it all; the good and the bad, the healthy and unhealthy. I’ve never been one to discriminate ;). Most recently though, I’ve been paying much more attention to how my cravings reflect my daily nutrient-needs. Today, for example, I was craving chickpeas yet again and needed what felt like my 45th snack of the day. I didn’t have tahini which is a common ingredient in hummus, but I did have just about everything else needed to make this delicious low-calorie, filling snack. 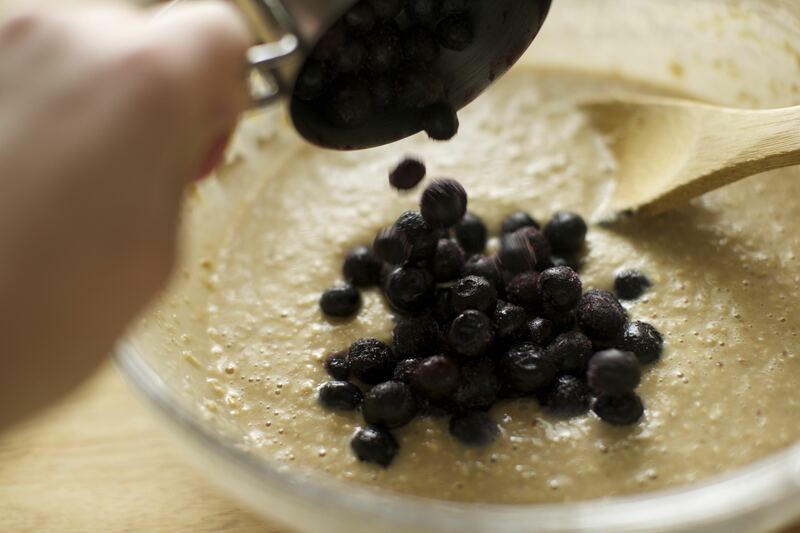 So, here’s what I threw together for a SUPER easy, preggo & bedrest-friendly recipe for hummus. 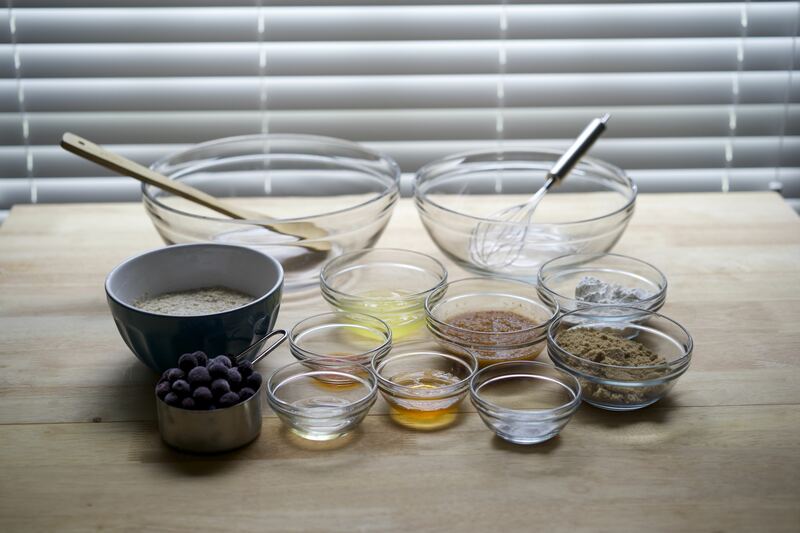 Mix it all together in a food processor! There you have it. Scoop out a few spoonfuls into a ramekin or small bowl, and you’re instantly ready to lay back in bed and enjoy this ‘lil heavenly homemade dish with some rice crackers, sliced carrots, or any other healthy side that your heart desires. It’s been a nice and easy weekend here in Oklahoma. I love weekends like this where there’s no agenda aside from cleaning a bit (but only “a bit”), guilt free laziness, and attempting to be healthy from time to time. The back of the label was a recipe for Lentil Soup & Kielbasa. Since I was already planning a slow cooker heavy beef stew for tonight (Sunday), I just wanted to keep it veggies & lentils only; nice and light. I researched a few other recipes on the web and ultimately came up with this little number below. I hope you enjoy!!! 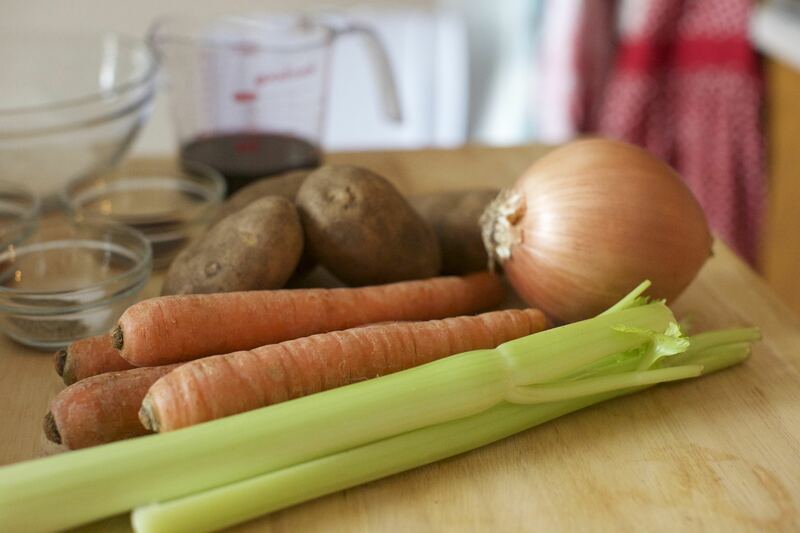 In a large pot, heat the oil then add in the onion, carrots, and potatoes. Let it all heat up & soften for a couple of minutes, then add in your seasonings: garlic, oregano, bay leaf, basil, sage, salt, and pepper. 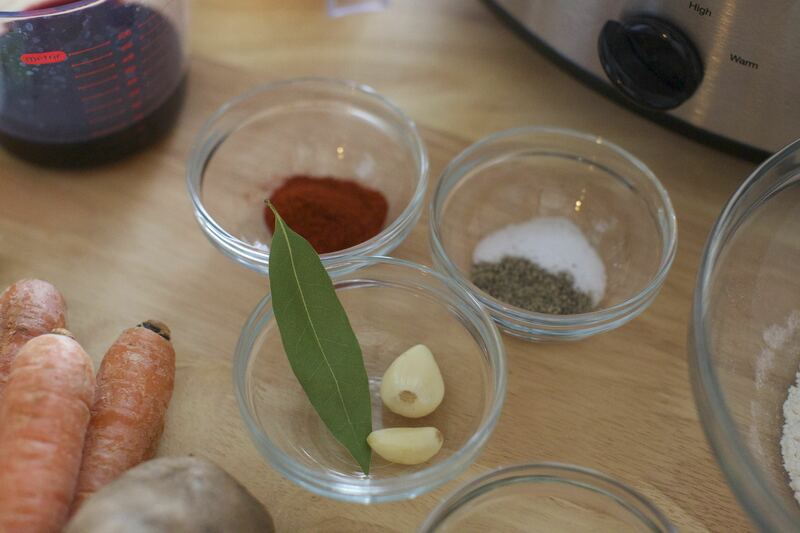 Stir & let it all together and let the seasonings snuggle up and say “heeyheeey!” to the veggies for a minute or two. I didn’t have a can of crushed tomatoes at home like I thought I did (womp womp) but I DID have two tomatoes ready to be messed with! Score! I chopped them up and used a potato masher to lightly crush them up a little (not too much though – I still wanted some chucks of tomato still in tact). I used one and a half tomatoes for this and it was perfect! Add those crushed lil’ “toms” to your soup mixture and stir it on in. Right after adding the tomatoes, go ahead and add in the water, chicken broth, and lentils. Stir it all up, cover, and lower the temp to allow the soup to simmer for 1 hour. Stir occasionally and add salt to taste if needed, but remember that the taste of salt really comes out at the end after letting it simmer for a while…so don’t go crazy ;). 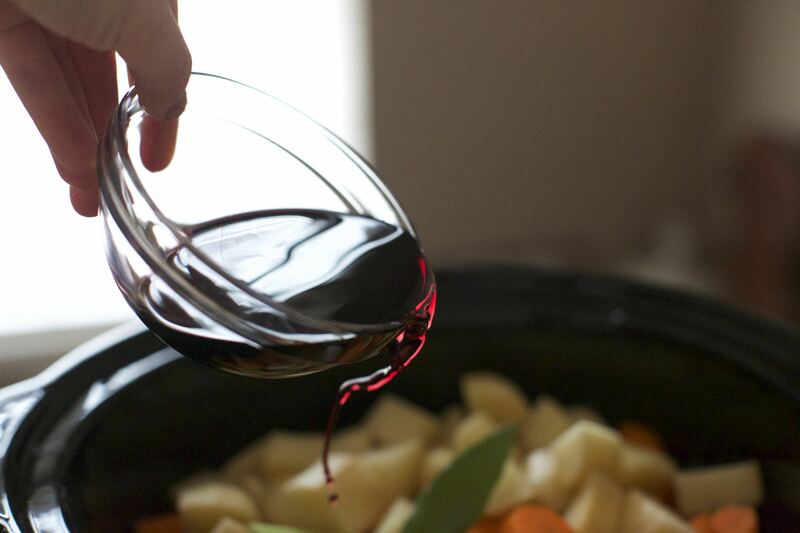 Remove the bay leaf, pour, and enjoy! Well goodness gracious. This was just about the most delicious, wholesome, healthy, and simple homemade soup I’ve ever made! Want some?! 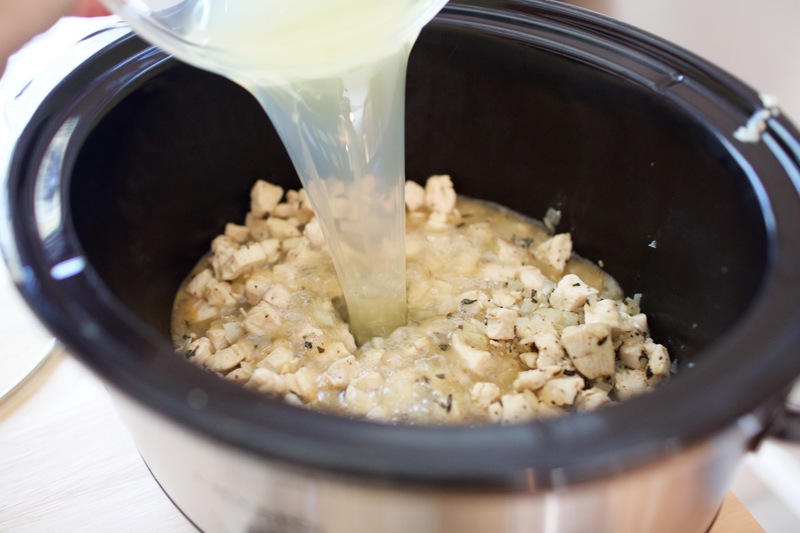 If you prefer your soup to be more brothy, you may want to add in more chicken broth or water towards the end. The broth gets absorbed by the lentils & veggies as you continue to cook it, especially when it also sits overnight in the fridge. Can’t wait to have more for lunch todaaaaay! 🙂 Lemme know if you give it a try! I’m so freaking excited that it’s officially Fall. Sadly though, it’s still like…754° here in Oklahoma. Mmkay maybe only 85°, but still. It definitely takes away a little from the good ‘ol East Coast chilly Autumn air that I’m used to this time of year. Luckily, that didn’t hold me back from embracing the season today and cooking something cozy. Something slooooowly cooked. 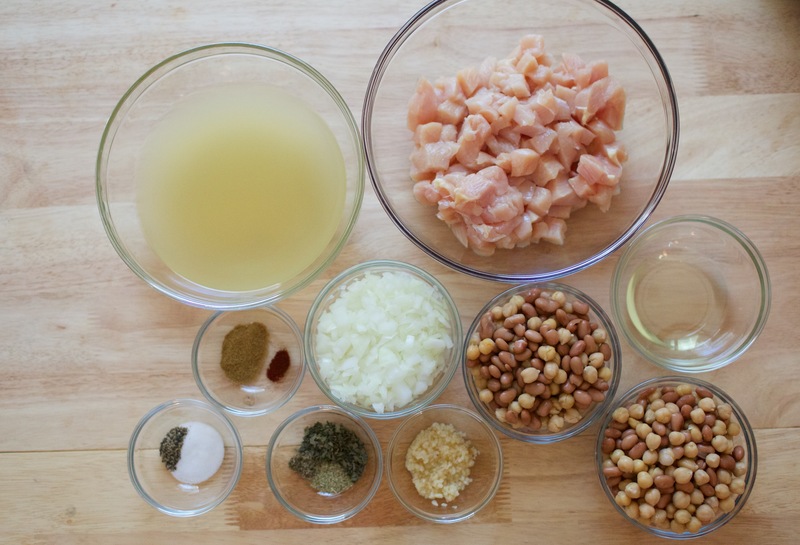 Something…like…white bean chicken chili! I read a few recipes then decided to create my own recipe for this marvelous masterpiece. Y’all ready for this?! Start by heating the olive oil in a non-stick skillet. Sprinkle the salt and pepper over the chicken before adding that to the skillet. Cook the chicken and onions in the oil. After about a minute, add in the minced garlic, basil, sage, rosemary, and chili powder. Stir enough only to just brown the chicken, then remove from the heat and put the entire chicken mixture into the slow cooker. 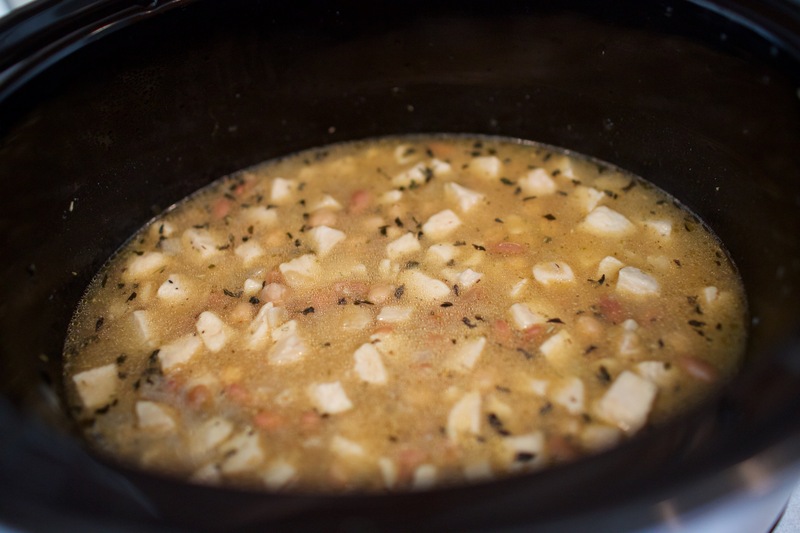 Mix 1 cup of the white bean mixture with ½ cup of the chicken broth. 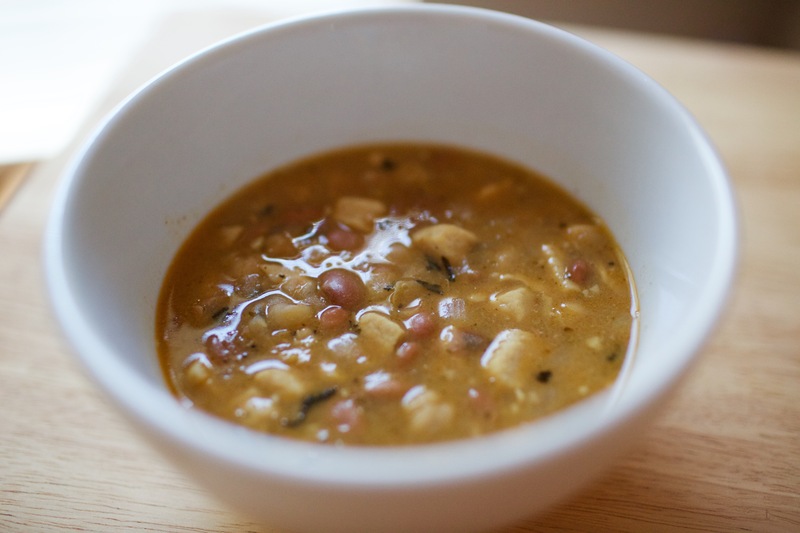 Mash up the beans in the broth until it creates a pulp-like consistency. This will help thicken the chili a bit…not to mention add in some serious flavor from the beans. Mmmmhmm! Along with the now gross looking mushed up beans, also add in the remaining chicken stock + beans to the slow cooker. Ohhhh infomercials. They were totally on the right track, though. I’m loving the set it, go for a run, take a shower, do some laundry, then BAM it’s ready and the smell of heavenly chili is infusing your lovely home – kinda cooking. Big fan :). Okay so you’re 3 hours in, 30 min or so to go. 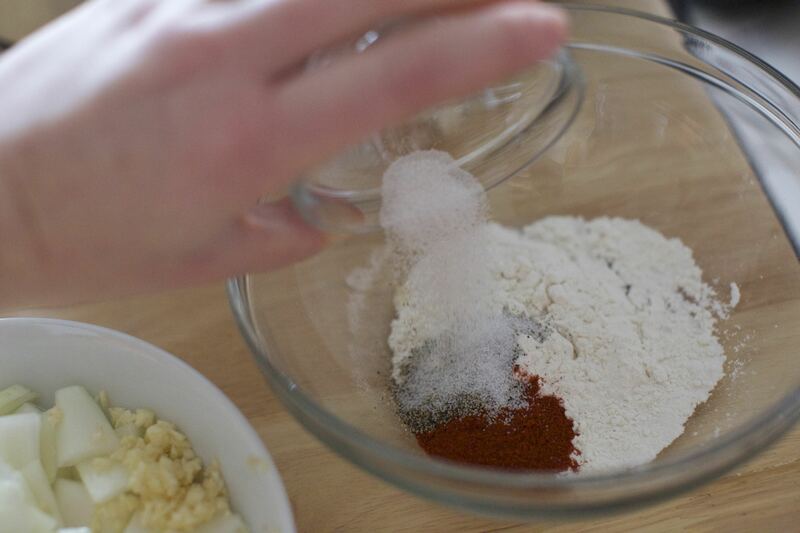 This is the perfect time to sprinkle in some of the all purpose flour to thicken up the chili. Let it simmer and thicken in the last 30 minutes. ENJOY!!! 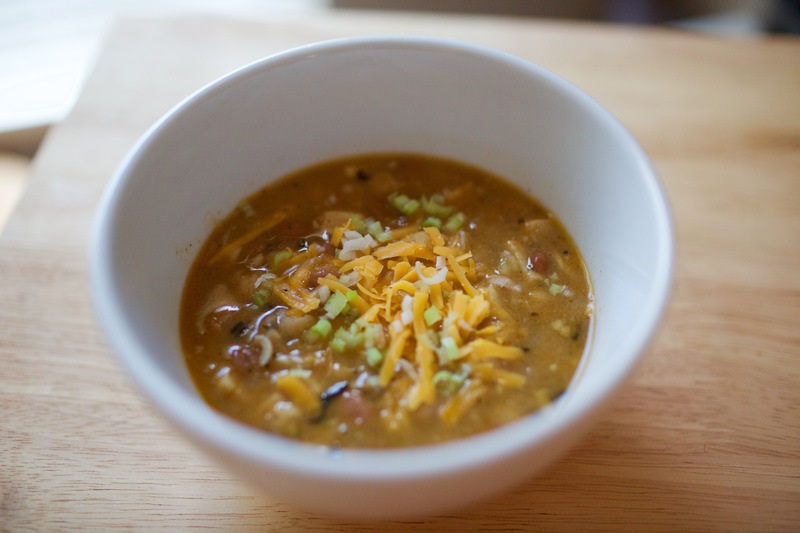 I’m head over heels for this chili, y’all. I really am. As I type this, Sean is on his 3rd bowl. No judging….hehe…but he really loves it. Highly recommended addition: shredded sharp cheddar cheese and chopped scallions! Sean also added a spoonful of sour cream. Have fun!!! My favorite season is finally here. Y’all…I’m obsessed. I’m completely head over heels for this season! Just like many of you out there I wanna throw on some boots over skinny jeans, wear cozy autumn-colored tops, and jump for joy in honor of all-things pumpkin. This post isn’t a review…a recipe…or a recommendation. Basically, I just love autumn so much that I can’t contain myself. I have a blog, and I’m not afraid to use it. I spy my favorite season! What’s on your list?! Are you as obsessed with this glorious season as I am? Add to my list by commenting below and keep the fabulous fall love flowin’! 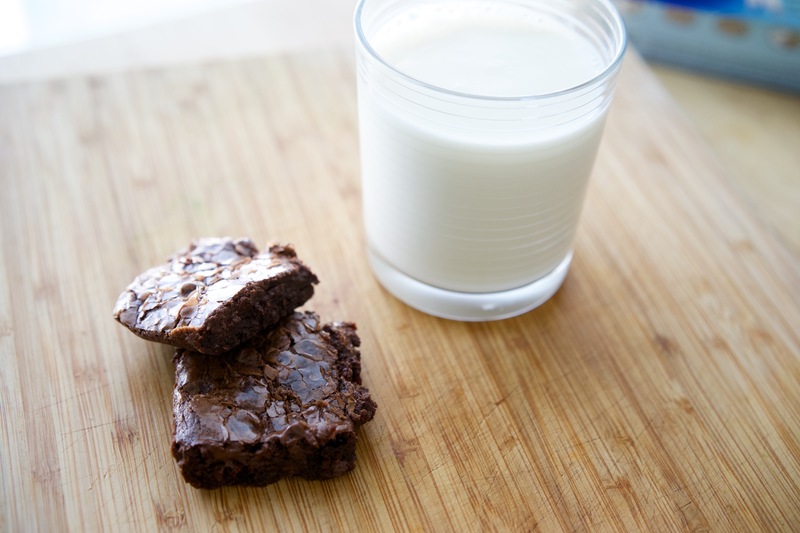 These are seriously delicious…made from scratch…chocolate chip-ie…cocoa-ie brownies. Out of this world, y’all! Earlier today I decided to go for an afternoon run. Silly Katherine. There was a heat advisory today that quickly turned my run into a slow walk underneath the unrelenting Oklahoma sun. After the heat-wrenching work out, I proclaimed to the hubby that I deserved something chocolatey. Something homemade. I really wanted to bake and decided on brownies, but since most homemade recipes yields a lingering bitter taste of cocoa, I decided this recipe deserved a few semi-sweet chocolate chips to amp things up. 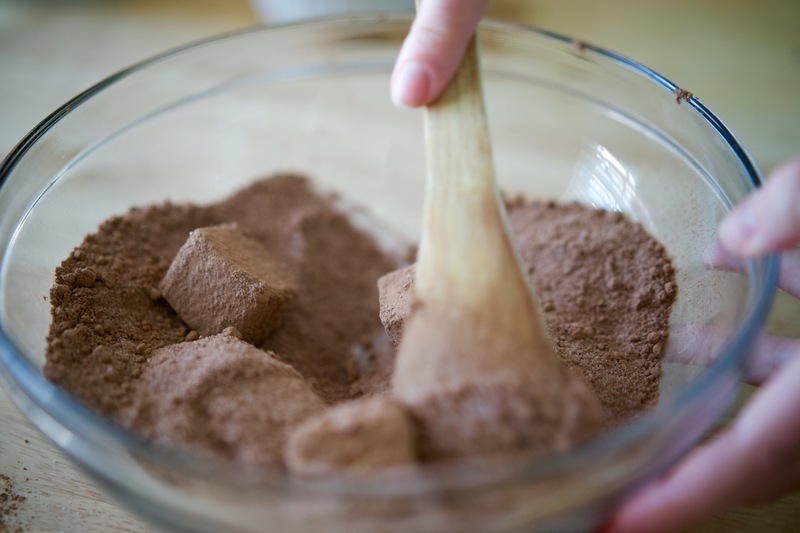 In a medium size bowl, combine your sugar, butter, cocoa powder, cinnamon, and salt. 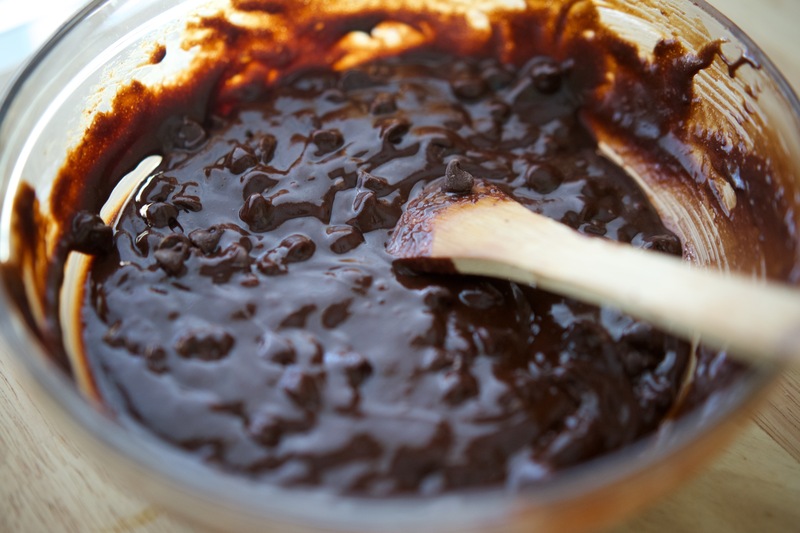 Temper the butter/cocoa/sugar mixture over a pot of lightly simmering water. Continuously stir until the mixture turns into a smooth consistency. Let the bowl cool for about 5-10 minutes. 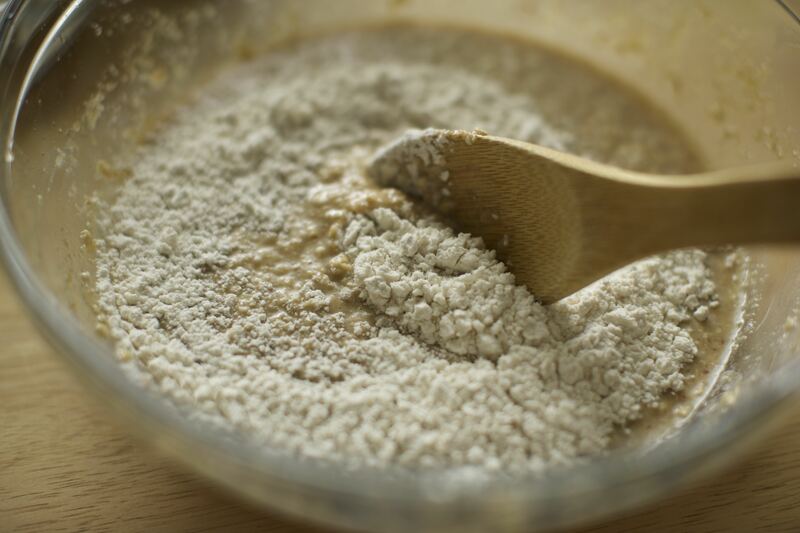 Then, stir in your vanilla extract, followed by both eggs, then the flour – stirring constantly. So…funny story: I had a ton of chocolate chips on stand by, not really knowing how much I’d actually use. I started to pour “just a few” chips in there before, “AaaaAAAAH! Ohhh shoot!” I basically overwhelmed the batter w/ chocolate chips. Trial and error is how the beautiful recipe (above) made just for you (and me…and hubby) became more accurate. I learned as I went along. The batter in the pic below has WAY more chips than I’d recommend adding. Stick to a 1/4 cup…MAX…or less or none at all is totally fine too. Do what feels right! …wwoooooo! I had only a 9 x 9 ” pan available, but 8 x 8 ” is even better to make these thicker if you have it. Line it up with parchment paper. It’s my new favorite thing! Among…like…4308591 other things of course. It makes clean up easy without needing to soak/wash/scrub your pan after all is done. ENJOY!!! We sure did. Better grab a glass of milk to go with it, or wine. It’s unbelievably delish. 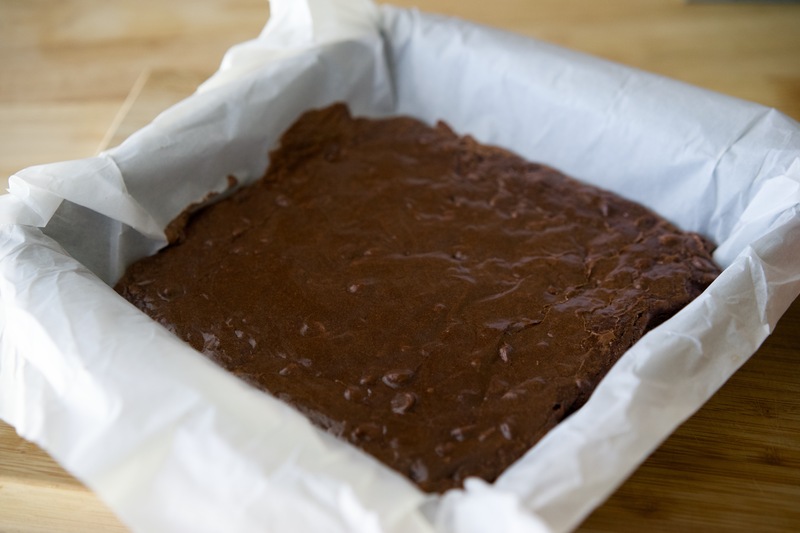 The richness of the cocoa, the sweetness of the semi-sweet chips, the subtlety of the cinnamon and vanilla altogether make these brownies stand out. I can’t wait to make them again. If you try out this recipe, let me know your thoughts! Sean and I have been eating much healthier these days. Ever since we booked our flights and hotel for our week-long Key West vacation (t-minus 2 weeks ’til we’re there!) we buckled down and vowed to do this whole “beach ready” thing as a team. Sean’s determination has totally impressed me, y’all. Seriously. The man has lost over 20 pounds!!! I’m so proud of him. 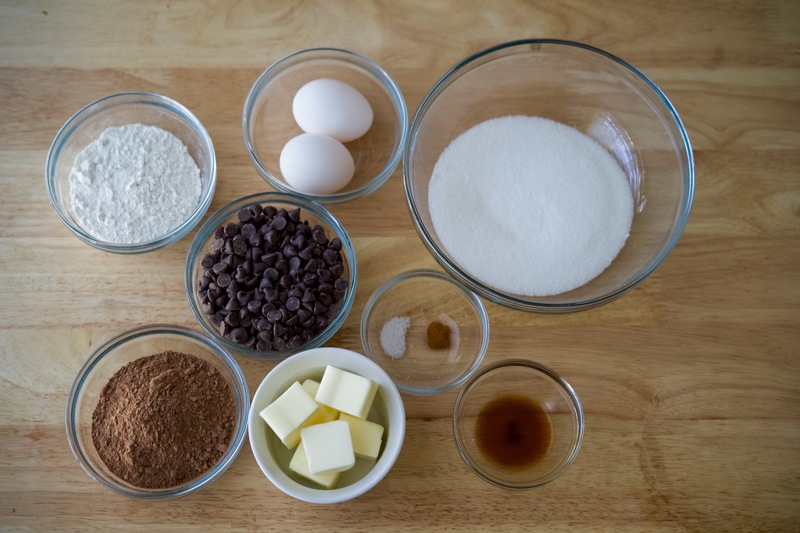 It has inspired me to choose healthier options and for that reason……I gotta be honest…..I miss baking. I really truly miss it. The butter, the sugar, the flour, there’s a lot of deliciousness in there that will neither help him, nor me on this healthy track. I’m so glad we’ve worked to keep most buttery, sugary foods out of our diet (for the most part). But, what’s a baking lover pursuing healthy foods to doooooo? Thank goodness for healthy alternatives. This morning I had the baking fever in me and had to do something about it. 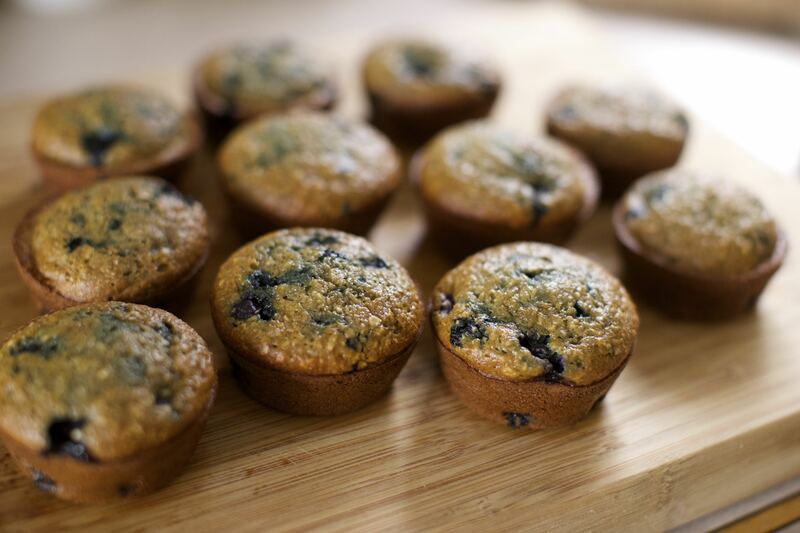 I researched a few healthy blueberry muffin recipes to consider some good alternatives to butter, egg yolks, and sugar. Check out my new favorite blueberry muffin recipe below! It’s pretty darn delish. After breakfast and a little relaxing this morning, my awesome friend & fellow Tulsa-area blogger, Jessica Sprenkel, came over to run around my little country neighborhood here in Owasso, OK. Part of my favorite route was cut short because of the crazy over flooded creeks we’ve had from the non-stop rain here in Oklahoma lately, but we made it work! She lives in Tulsa and is a fitness trainer who has really inspired me to stay focused with my running and overall healthy living. Venture on over to her blog, Sprenkled, to get yourself inspired as well on this glorious Memorial Day! We finished our workout with a smoothie: frozen bananas, spinach (never tried it in a smoothie before…and LOVED it! ), frozen blueberries, milk, and ice. Highly recommended ‘lil post workout refreshment. I sent her home with some blueberry oatmeal muffins. Enjoy, Jess! Some of you on Instagram asked for the recipe. Here it is! 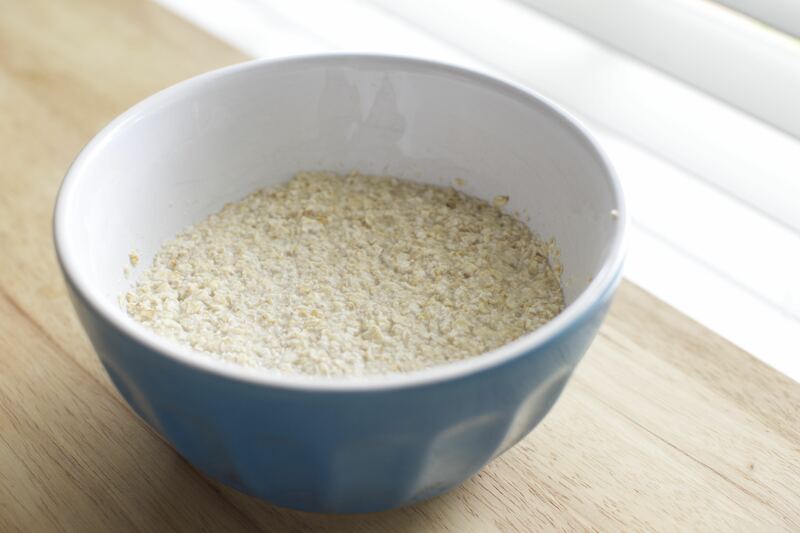 Place the oats in a food processor & pulse 5-7 times. 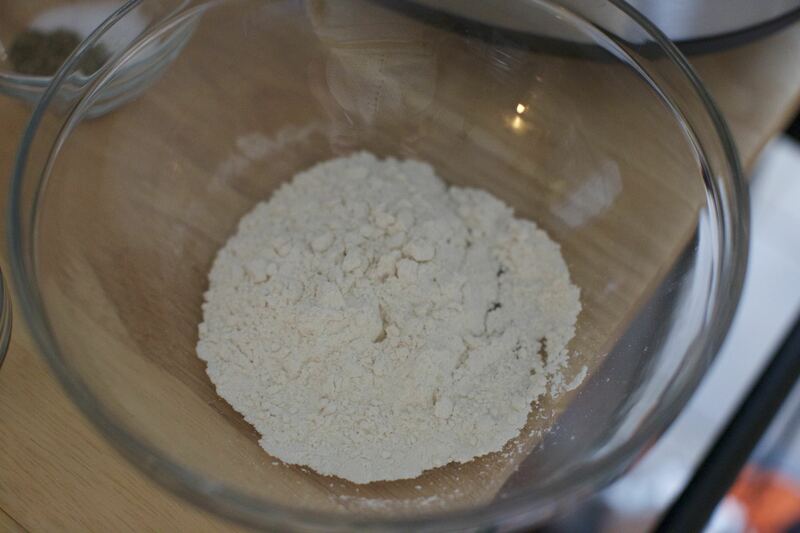 Remove from food processor and mix with milk. Let the chopped oats soak in the milk for at least 20 min. If making sauce from 1 apple, remove peel & core, and slice into cubes. Puree until it looks juuuust like apple sauce 😉 Easy peezy! 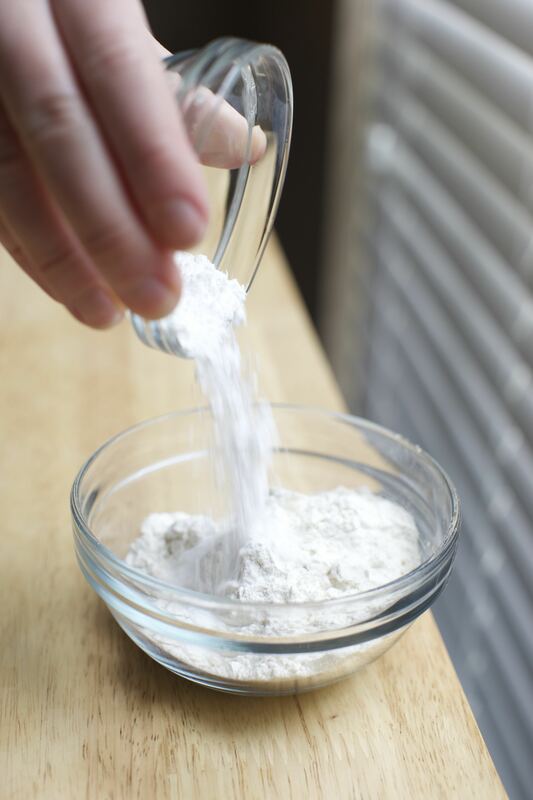 Mix the salt, cinnamon, baking soda, and baking powder into the flour in a separate bowl. 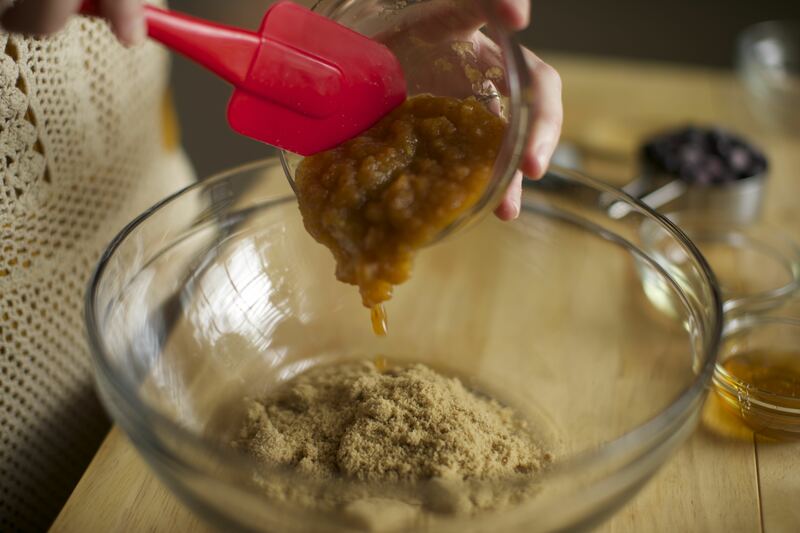 Add half of the dry mixture to the sauce mixture, stir slowly, then add the other half of the dry mixture until it’s blended. My favorite step! Add in those beautiful blueberries. 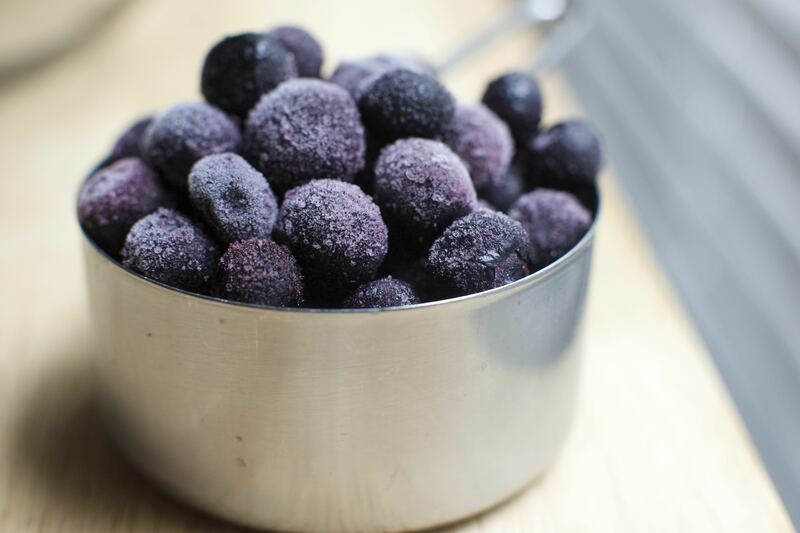 I prefer frozen, but if you have some delicious durable fresh berries – go for it. Fun fact – did you know that Target sells some DELICOUS fresh blueberries? I ate all of them at work but luckily I had these frozen bad boys ready on stand-by. 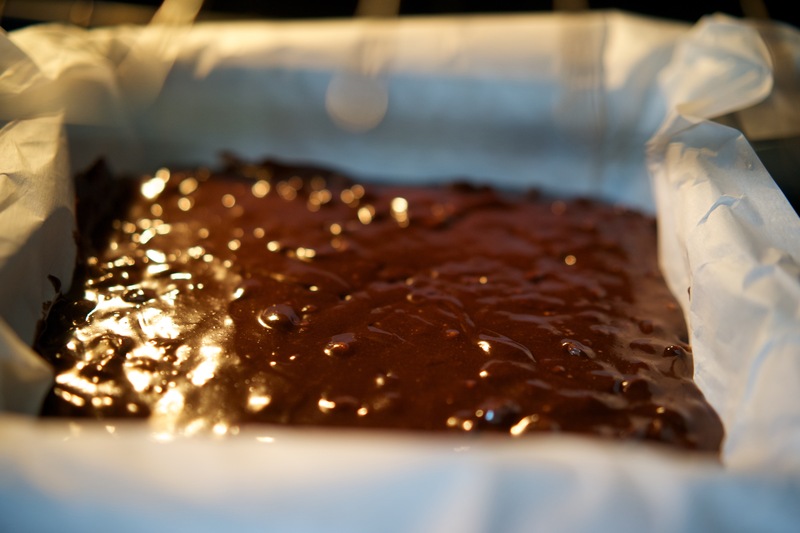 Fold them in to your mixture – mine turned blue like…immediately. I think that’s perfectly fine. If it doesn’t, even better. Divvy up the mixture evenly into a muffin tin for exactly 12. Into the oven @ 400 degrees it goes! Keep a close eye on it. I set my timer for 24 minutes and that was PERFECT! Wanna see? It’s my 31st birthday today! I’m spending the day with my hubby. He’s my favorite person 🙂 We’re exploring Austin, TX all weekend and are having the time of our lives! A weekend getaway to a new place often heightens my senses to the world around me. The air, sights, and sounds all stand out a bit stronger because it’s new and different. That got me thinking – I hope I take enough time to appreciate the little things that I adore in life. I used to be better at that. Throughout high school and college I’d escape for a few minutes (or hours) and add to a list of what I loved. Totally random things…like…how people tilt their head when they eat a taco, or a much needed outburst of laughter after something has gone horribly wrong and that poor moment needs some comedic relief. Before I knew it, my list had exceeded 1,400 things. The sad truth is that I have no idea where that book is now. But the idea of doing that, of writing down the little things that I love about life, well I think today’s a brilliant day to bring it back. Snuggling with my yellow lab, Stella. The entire experience of walking around an Anthropologie store. Slowly sipping red wine on a cold night. The 1st cup of coffee in the morning. Getting positive results from using little pockets of time wisely. Laughter from my favorite people. The distant smell of a campfire. HGTV & The Food Network. Getting asked to take strangers’ group photos. When a baby smiles or yawns. Hearing perfectly beautiful harmony sung a cappella. People who don’t complain, appreciate life, and embrace each day. More than any of these, more than anything in the world in fact, I love and adore my family and friends over all. I’m a very lucky lady to have such joy surrounding me all the time. Not quite sure how I got so lucky, but I thank God everyday for y’all. That right there’s a long title, but a scrumptiously simple recipe. I’m sending a virtual high five to the lady who submitted this recipe. I found it from Taste of Home. Check it out! I made a few changes though, so below is my own adaptation of it. I didn’t have the mini-chocolate chips that she calls for, so I used 1/2 cup of regular chips instead. I substituted shortening for good ‘ol butter. She recommends using instant oats but I love the look, texture, and durability of Old Fashioned Oats – so I used those instead as well. They held up beautifully in the baking process! 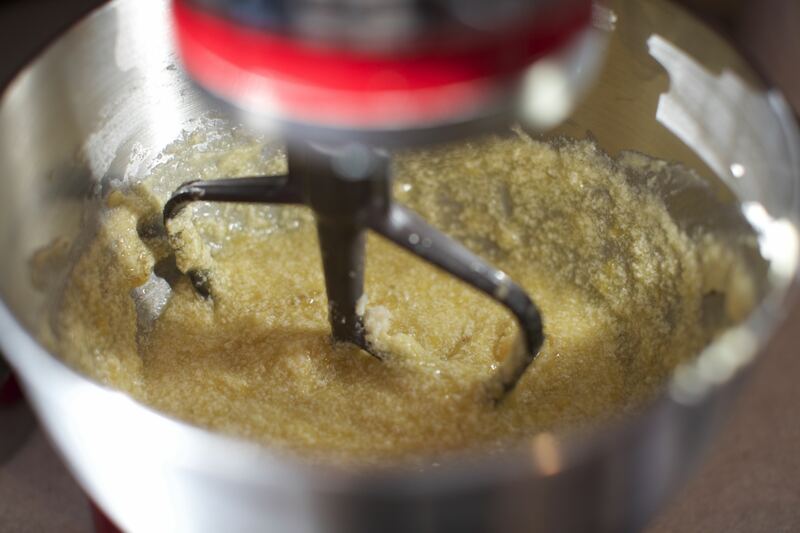 In a bowl or mixer (low to medium speed) combine the sugar, softened butter, and eggs all until smooth. 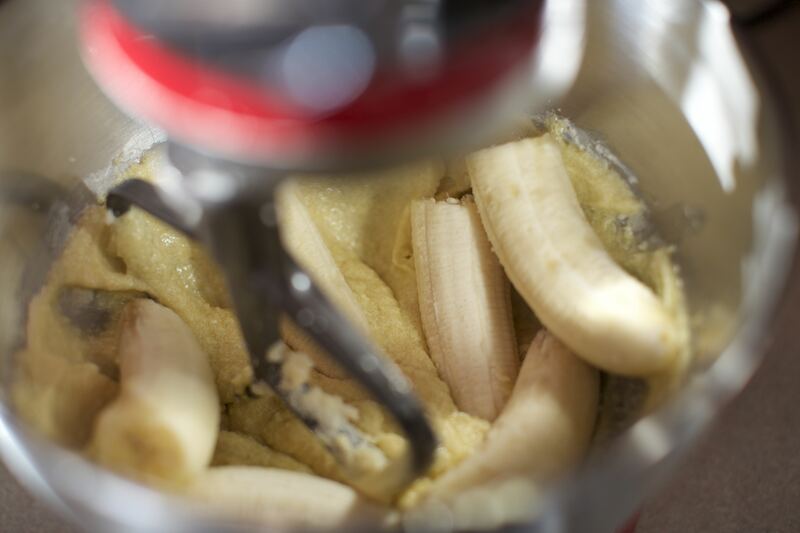 Peel and add the 3 over-ripe bananas to the sugar/butter mixture. Add in the baking soda, baking powder, and salt. 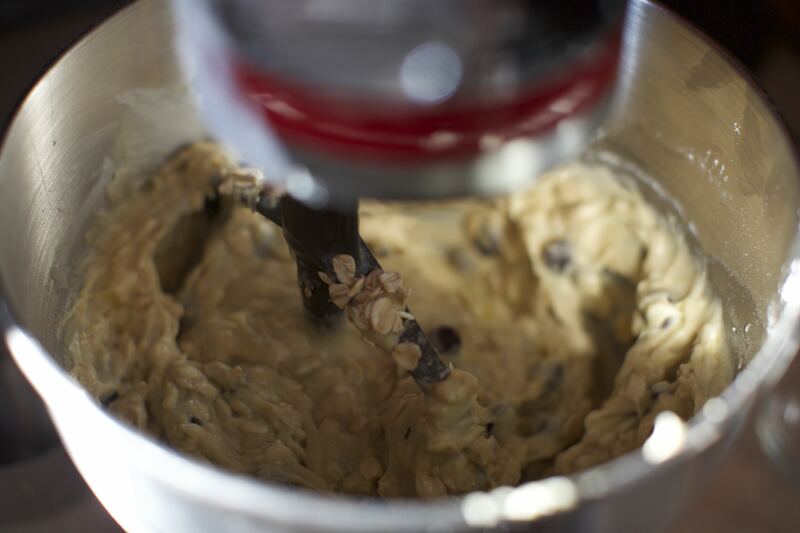 Gradually add in the flour, then the oats, then finally the chocolate chips. 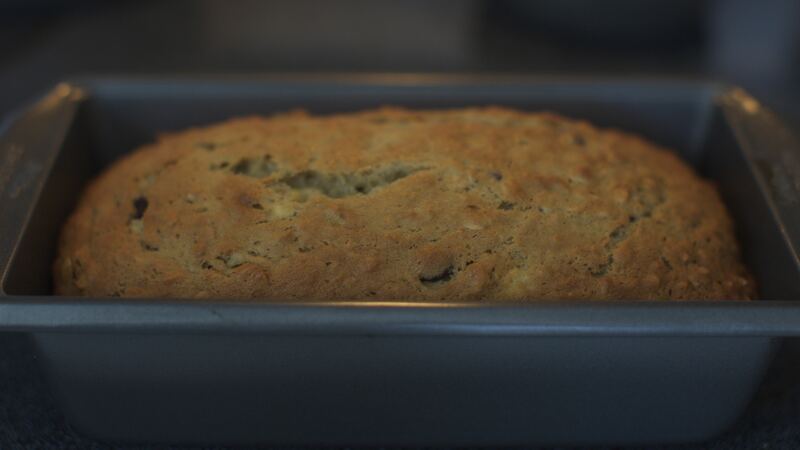 Pour the mixture into a greased bread pan, and place in a pre-heated oven. Your timer should be set to 40 minutes, then check on it for 10-15 minutes. 50-55 minutes total should do the trick, but as ovens vary – just check on it starting around 40 minutes. Check the center to make sure it’s fully cooked. Remove from the oven and let it rest for 10 minutes. ENJOY! Hubby and I sure did. It should last the week if it’s just you and a spouse/roomie…but if you have a large household or lots of housemates, it’ll be gone by the end of the day. 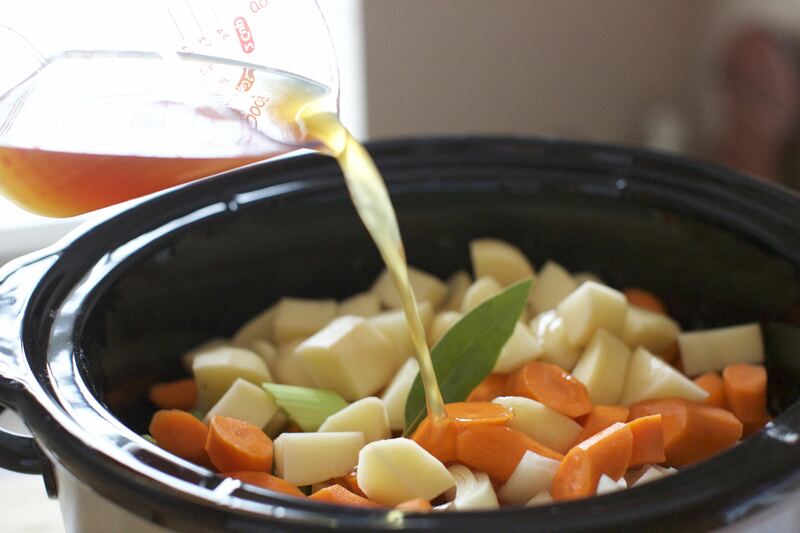 First of all a HUGE thank you to all of you who submitted your slow cooker recipes over the weekend! Even though I have like 3720483 to choose from, keep ’em coming! 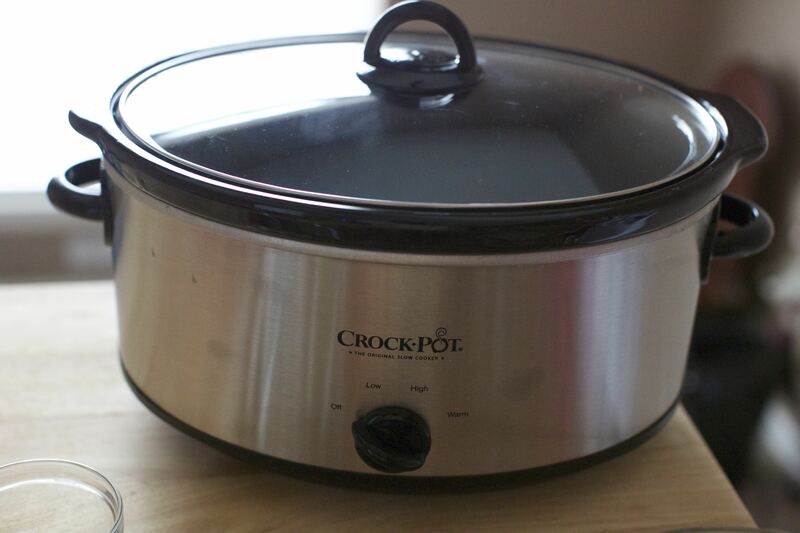 You can submit your favorites in a form in this post: Slow Cooker Recipes, Please! 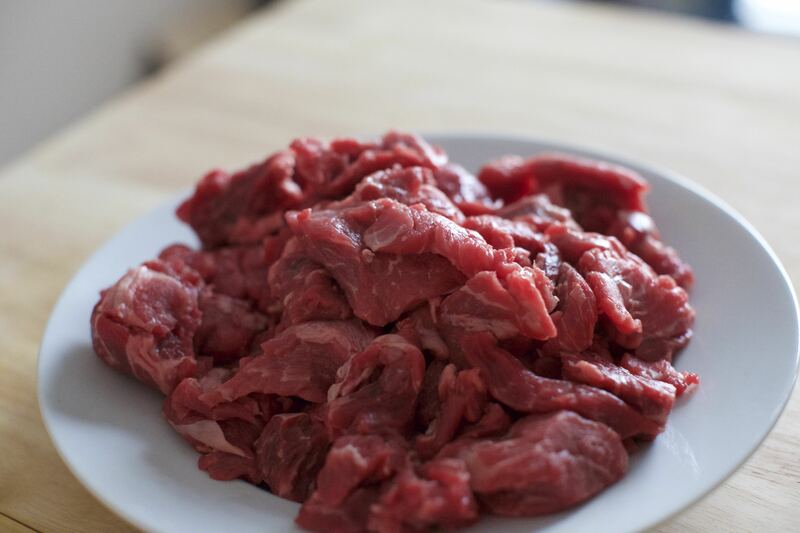 2 lbs of Beef, chopped…you can usually buy pre-cut beef stew at the grocery store. Be sure to look for beef that is well marbled with fat as that’s what will make it melt in your mouth with flavor after slowly cooking for 8 glorious hours! 2 tsps Worcestershire Sauce…I’m now exhausted from trying to learn the correct spelling of that, by the way. 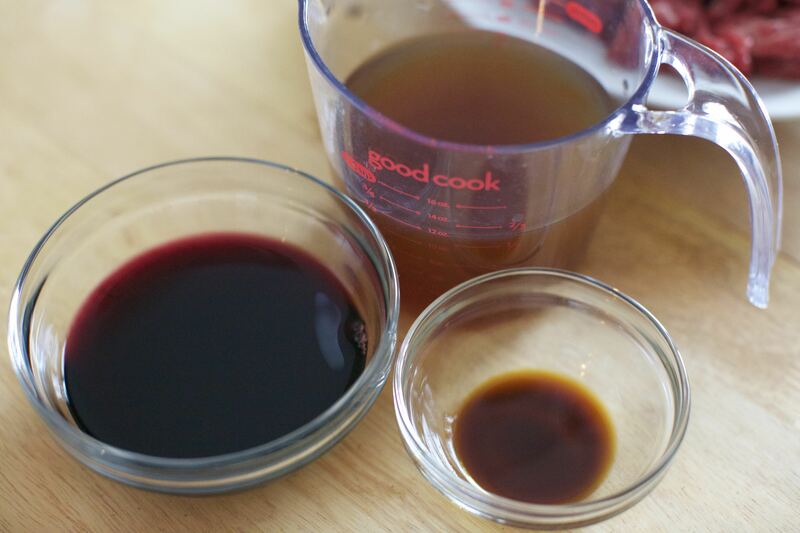 1/2 cup red wine…I used a Cabernet Sauvignon – slightly dry with just the right hint of sweetness. Peel and chopychop up the onion, garlic, and veggies! This takes a while so get the music playin, wine pourin, and hips movin! This may sound odd, but peeling and chopping veggies are actually two of my favorite things about cooking in my kitchen. It’s…it’s kind of why many of us loved coloring in elementary school (or…um…last week) – it’s therapeutic. It’s simple. It’s also (usually) an un-rushed step that allows us to just zone out and relax while preparing something glorious. No T.V. or iPhones…we’re using our hands and creating something to feed our souls. I just LOVE it! 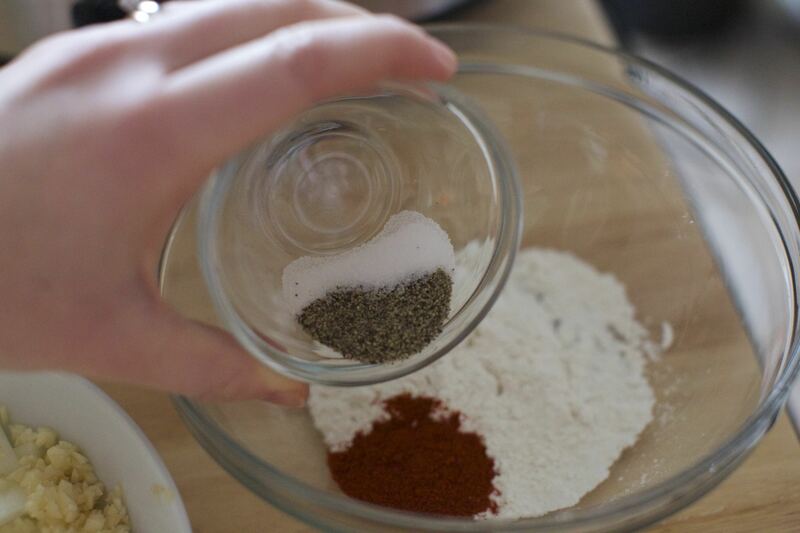 Mix your dry ingredients together: flour, salt, pepper, paprika, and seasoned salt. 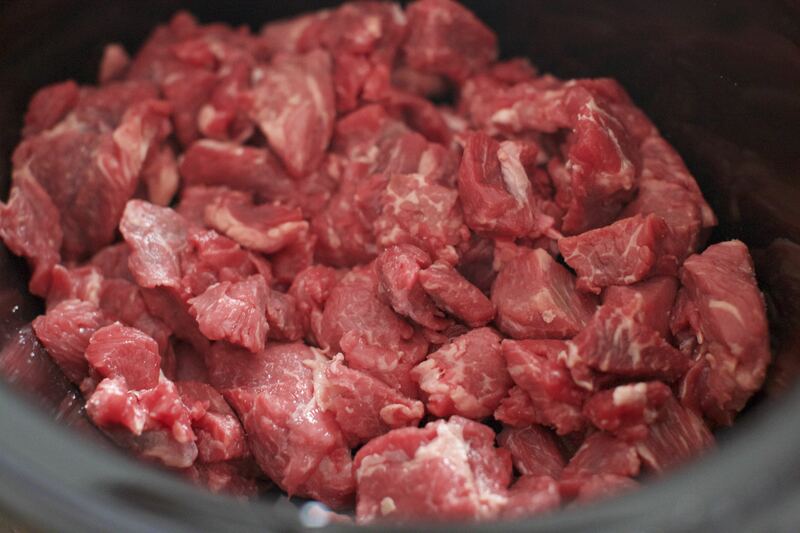 Lay the beef across the bottom of the slow cooker, then drizzle the dry ingredient mixture over the beef. Then…get your hands ready…’cause you’re goin’ in!!! Rrrraaawrrrr…get on in there with your hands!!! 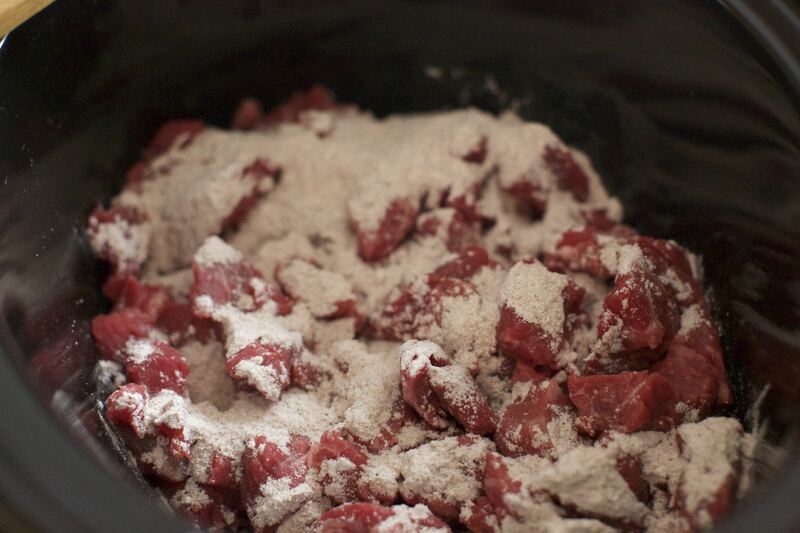 You’ll want to coat the beef completely in the flour mixture. Tadaaaah! It should look a little like this when it’s all coated. Mix it up a bit one last time, set the slow cooker on LOW, and let it do it’s thang for around EIGHT HOURS. Ahhhhh how glorious. I could drive down to Dallas, TX and BACK in that time! If you’re able to though, I recommend stirring it a couple times to make sure the flavor and juices are distributing evenly. Okay one last thing – ya gotta add a crunch to this. Get some toast or ideally a slice of a baguette, toast it up, and drizzle a little butter overtop. 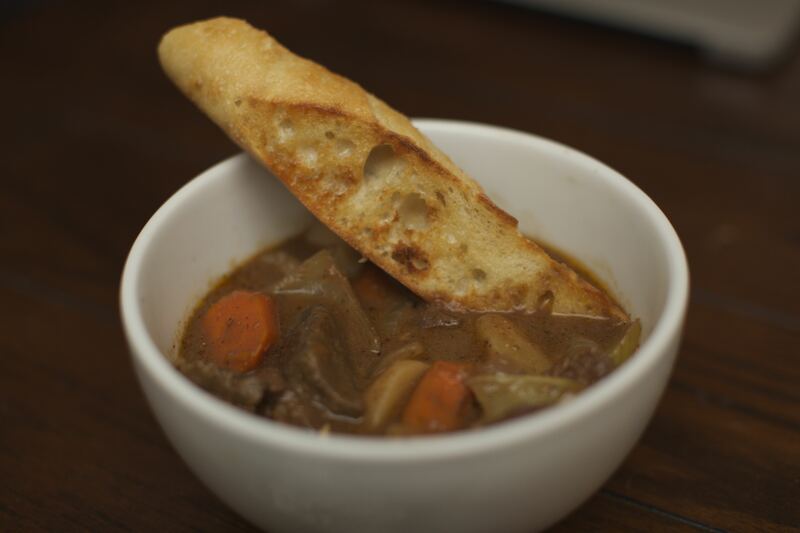 It was heavenly, and the perfect solution to soaking up the stew broth as you savor each and every bite. The beef just melts away with each bite, the veggies are perfect, and the spices marry beautifully! Enjoy, friends! Let me know how the recipe turned out for you! I have the best memory. 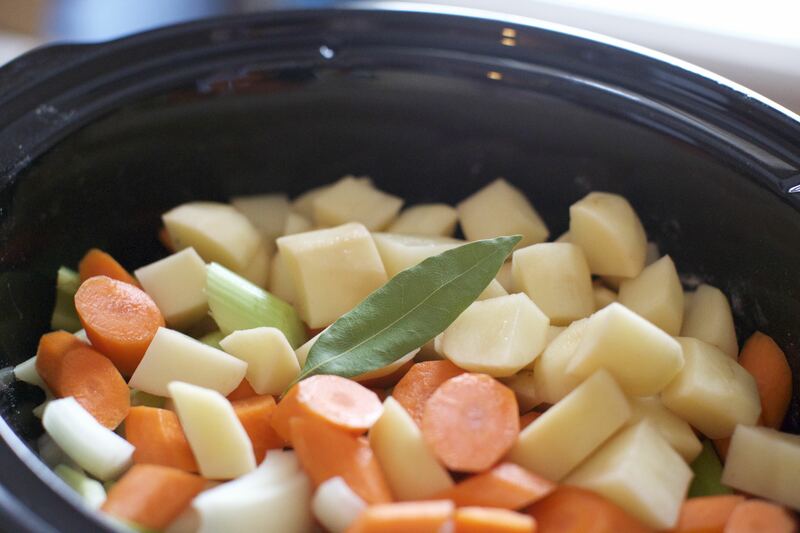 But seriously, y’all…Hallelujah for a SLOW COOKER in my life! How have I not had one of these before? Before this bad boy, we did actually have a very tiny little red slow cooker that Sean randomly won from a night at Dave & Buster’s…but…I think that speaks for itself as to why I’m way more excited about this new purchase – the real deal. I already have a gorgeous looking Beef Stew cookin’ away in there at the moment. It’s got about 4 hours to go, so I’ll probably post those step-by-step instructions & my thoughts on the outcome tomorrow for anyone interested. Our home smells amazing, by the way. But this post isn’t my usual how-to story; it’s more of a call to action. Will you (please oh please!) share a favorite slow cooker recipe (or twelve) in the feedback form below? I’ll select a few favorite submissions and try them out here on Newlie, with cheers and praise back in your direction of course. Ahhhh I cannot wait to try out your favorites. Looking forward to your submissions! For our 2nd wedding anniversary, Sean and I decided to dine in (I made THIS: Bourbon Glazed Salmon) but a few days before we also celebrated with a nice dinner out on the town at Juniper in downtown Tulsa. Fantastic experience. I’d like to rave about our evening there for a jiffy. Even if you don’t live in Oklahoma, it hopefully provides a nice window into how on-point Tulsa’s culinary scene is. On my OpenTable online reservation I added a comment to share that it was our anniversary. I wasn’t sure if anyone would notice – sometimes restaurants appear too busy for that sort of thing. Sean and I arrived around 8pm and were greeted at the front desk with a delightful “Happy Anniversary!” wished by Juniper’s owner, Chef Justin Thompson. Way to make us feel welcome, Chef – thank you so much! That set the mood for our evening beautifully. We ordered the pan fried sweetbreads for our appetizer; a dish that was a bit of a daring culinary adventure as neither of us ever tried sweetbreads before. While we waited for our 1st course, Sean adorably decided to embarrass me by putting his napkin on top of his head. Very normal dining scene for us. He was successful in embarrassing me, by the way – I blushed and quickly looked around the room, nervously giggling as I saw diners looking our way. We were really impressed with our appetizer (pictured on right). The sweetbreads were pan friend in a sage brown butter (helloooo…) and placed on top of a brilliantly seasoned butternut squash puree, accompanied by crispy kale and hazelnuts. It was a fabulous wintery dish that gave one last nod to autumn cuisine. Our entree stopped us in conversation. Everything was perfect. The foodie nerd in me has grown to expect a high standard when its restaurant boasts such a thing. So…for me to not only say, “perfect” but also to italicize and bold it in this post is to deliver a heartfelt high five to Chef de Cuisine, Tim Slavin. Nicely done, Chef. I had the scallops, perfectly seared and seasoned. I am a sucker for seared scallops paired with white beans. It reminds me of the first dish I ever tried at The Bocuse Restaurant on The Culinary Institute of America’s Hyde Park, NY campus when I first visited the campus. It’s absolutely one of my favorite combinations. I loved everything that accompanied this pairing at Juniper – the touch of truffle oil in the white beans, the elegantly ribboned carrots cooked in brown butter, and an added bit of interest from the fried sage leaves. Sean had the short ribs which had been beautifully braised in Marshall IPA, then placed overtop a jalapeño pepperjack polenta and roasted vegetables. He took a bite, closed his eyes, and let out a sigh: “…hhhmmmmm.” That’s his version of a “bravo.” He offered a taste, and it just melted apart as slowly cooked short rips should, having been tended to over just the right time and temp. Desert was an obvious choice. “YES!” – Sean and I both interrupted our server with a smile. We chose to split “Justin’s Favorite Chocolate Pie” which was as if chocolate’s “greatest hits” formed an album and this took the number one spot. It’s a reunion of decadently delicate chocolate mousse, oreo crumb crust, chocolate ganache, and a nicely balanced whipped cream. We talked and giggled forever. I love that about being married to + in love with your best friend. You can just talk about everything from politics to your future as a family, until suddenly you look up and you’re the last ones in the restaurant. Even the tipsy table of eight had already left. Thank you for making us feel welcome and un-rushed, dear Juniper staff. We appreciated that very much. We will be back – you can guarantee it. I whole heartedly recommend this to anyone else interested in a fine-dining quality taste of Tulsa.